Although the Island of Hawaii is known as the Big Island, there are only a handful of luaus there. Offered only on Friday nights, the Kona Village Resort’s Luau is considered by some to be their favorite Big Island luau, in part because of its remote location. The ‘Kamehameha Court Luau’ at the Hilton Waikoloa Village is held every Tuesday and Friday. The Mauna Kea Beach Hotel hosts their luau every Tuesday evening. The ‘Island Breeze Luau’ is held on the grounds of Kamehameha the Great’s former estate at the King Kamehameha Kona Beach Hotel, making it a truly royal Hawaiian experience. It is Kona’s only beachfront luau and has been rated the best luau on the Big Island by visitors, locals and travel writers (including the prestigious “Best of the West” award). 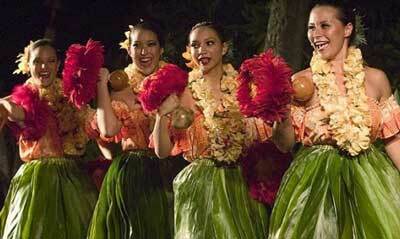 It is our recommendation if you’re looking for a great Big Isle luau. Island Breeze Luau is located right in the heart of Kailua-Kona, overlooking a small bay with sparkling blue water. Before the ceremonies begin, the whole family will enjoy demonstrations of Hawaiian arts and crafts. Weave coconut fronds, learn how to open a coconut, or have an artist draw a Polynesian tattoo on your arm (don’t worry, it’s removable). There’s an open bar and delicious Mai Tais are included. 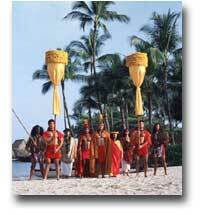 The festivities begin when the Royal Court, representing King Kamehameha I and his retainers, receive a traditional greeting by the Court Conch Herald and Court Chanter as they arrive at Kamakohonu Bay aboard an outrigger canoe. You’ll then follow the procession into the Royal Grounds to see the main course removed from the “Imu” (underground oven). 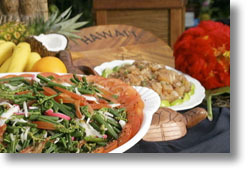 Kalua pig is just a part of the sumptuous 22-dish dinner buffet that features traditional Hawaiian and American dishes. The highlight of the evening is the spectacular Island Breeze Polynesian Revue. From the Fijian and Maori dances of war to the gracefulness of the Hawaiian Hula dancers’ hands, this fabulous group of Polynesians brings you a fun filled evening you won’t soon forget. 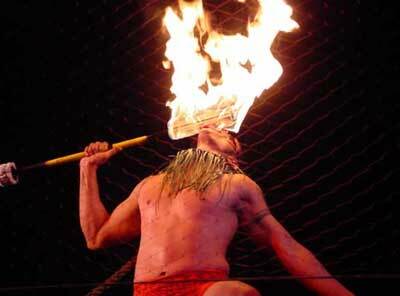 The daring Samoan fire knife dancer highlights the evening with an astonishing demonstration of bravery and skill. You’re also welcome to view the imu preparation in the morning, just be there at 10:15. It’s a lot of fun to watch and a good primer in case you want to try this in your backyard! Photos courtesy of Island Breeze Luau. Combining modern dance and traditional Polynesian dance to tell the story of the early settlers of the Pacific, Hawaii Loa Luau (formerly known as the “Gathering of the Kings”) is filled with mystery, intrigue, courage, and hope. 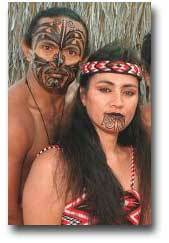 It depicts their journey across the Great Pacific to the lands they settled along the way. 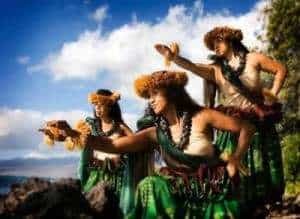 This is their history coming alive through melodic lyrics, deep poetry, and enchanting dance, exhibiting a kaleidoscope of vibrant colors and rhythmic beats unique to the Pacific Islands. A new sound, capturing the best of both traditional and modern music and dance, draws the participant into a timeless place full of enchantment and energy. Before the spectacular show, you can dine on the culinary treasures of Hawai’i, Samoa, New Zealand and Tahiti. From fresh seafood to papaya chicken and tropical fruit, this is an authentic blending of local Hawaiian favorites prepared by the award-winning chef at the Fairmont Orchid. Photos courtesy of Hawaii Loa Luau (Gathering of the Kings). The Royal Kona Resort in coordination with Tihati Productions presents “Lava – Legends & Legacies,” an Island-style celebration of the best Hawaii has to offer! A breathtaking backdrop of a vibrant Hawaiian sky displays the Kona Coast’s best sunsets and provides a spectacular background for the Royal Kona Resort Luau. The ocean front setting highlights the extraordinary energy and appeal of this dynamic and popular Polynesian show. Enjoy an evening of feasting, music and dance as we present a journey through the South Pacific’s legends and lore in historic Kailua-Kona. The call of the conch, the lighting of the torches, and the beat of the native drums beckon you to escape to the Hawaii of your dreams. Relax with cool tropical trade winds and enchanting Hawaiian melodies. Enjoy Hawaiian arts and crafts followed by the unearthing of the Kalua Pua’a (roasted pig) during the Imu Ceremony and all-you-can-eat luau dinner buffet. After experiencing a delicious all-you-can-eat Polynesian buffet, you’ll enjoy the acclaimed cast of musicians and dancers as they take you on an authentic journey through the South Pacific Islands of Hawaii, Tahiti, Raratonga, New Zealand and Samoa, through the travels and romance of Holomoana (the voyager) and Kalua (Hawaiian princess). 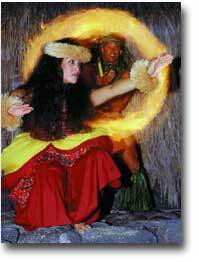 Their performance includes songs and dances rarely seen in typical luau shows and is highlighted by a Samoan “fire knife” dance, simply too amazing to miss!